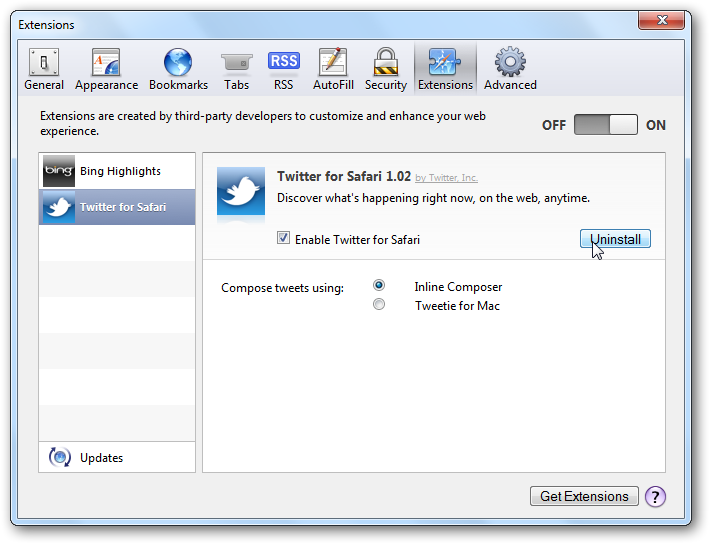 Safari 5 is one of the least used browsers on Windows, but would you be likely to use it more with more features? The latest update to Safari made it incredibly simple to install extensions, so let’s take a quick look at what it has to offer. Several weeks ago we looked at how to install extensions in the new Safari 5, but it required a rather complicated process to get everything working. Now Apple has updated Safari and made it very simple to install extensions from their official Extension Gallery. First, though, you’ll need to make sure you have Safari 5.0.1 or later installed. 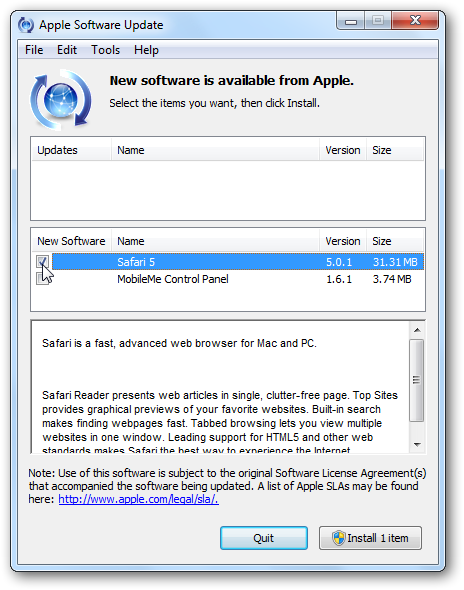 If you’ve already installed Safari or other Apple programs, open the Apple Software Update tool to get the latest version of Safari. 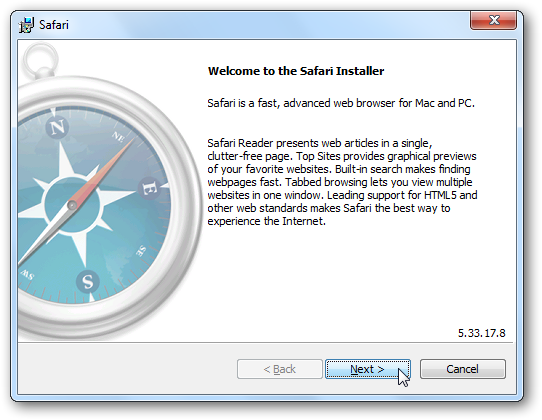 This will offer you the latest version of Safari, or offer to install it if you don’t already have Safari installed. Select the update or installation, and click Install. Be sure to uncheck the other updates they offer that might be needless on your system. Alternately, download Safari from the link below, and install as normal. Thankfully, the installer doesn’t try to install Bonjour this time, so you won’t have to worry about extra stuff getting installed. Once the latest version of Safari is up and running, you can quickly get started finding and installing extensions. 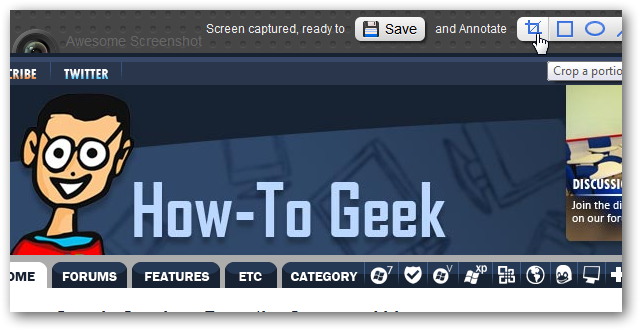 Click the Gear icon in the far right of the toolbar, and select Safari Extensions Gallery. This will open the Safari Extensions Gallery webpage, where you can browse and preview available extensions that have been approved by Apple and digitally signed. When you find an extension you’d like to install, click the Install Now button below the description. Seconds later, the button will change to show that your extension is now installed. That’s all there is to it; your extension is now running with only one click! Safari Extensions can add lots of functionality to the browser. They can add more to the browser than Chrome extensions can, but still are less powerful overall than Firefox addons. Here’s some interesting features we added with some of the available extensions. 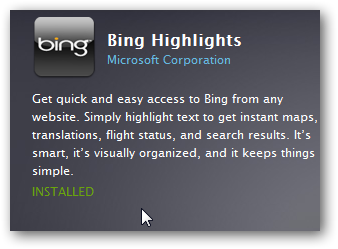 The Bing Highlights extension lets you quickly search the web or look up a map by just selecting text on a page. Twitter for Safari adds a toolbar that shows related Tweeters from a webpage, which is a great way to discover and keep up with the author and other people mentioned in an article. It also lets you search Twitter directly from a sidebar in Safari. We were excited to see the Awesome Screenshot extension for Safari, and it works almost identical to Awesome Screenshot for Chrome. The only feature it was missing was the ability to capture all of a page; hopefully this will be added soon. Finally, if you’ve been using Chrome for a while, you may be frustrated by the status toolbar taking up space on the bottom of your browser all the time. 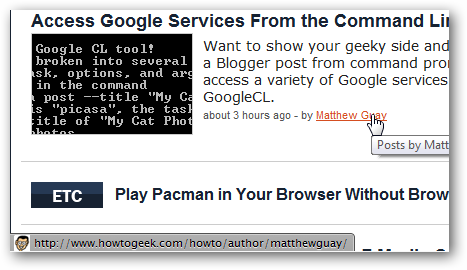 The Ultimate Status Bar extension fixes this with a Chrome-style preview version of the status bar that even expands short URLs so you can see where a click will take you. If you’ve installed an extension but don’t find it helpful, you can quickly remove it from Safari. Click the gear icon on the right of the toolbar, and select Preferences in the menu. 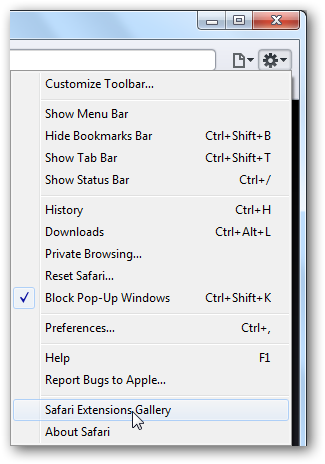 Click Extensions on the top of the Preferences window. 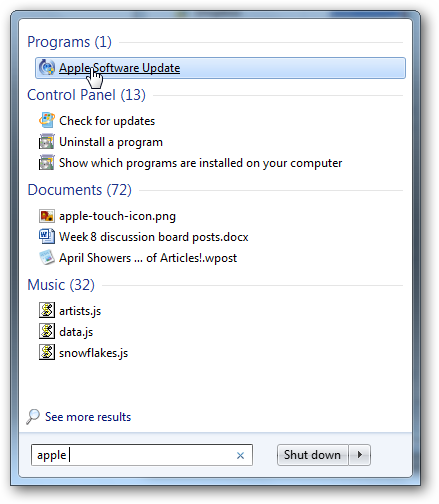 Here you can change settings for your extensions, or click Uninstall to remove an extension. Click Uninstall to confirm you wish to uninstall this extension. Alternately, if you’d rather turn off all extensions, click the slider at the top of the Preferences window to disable extensions. 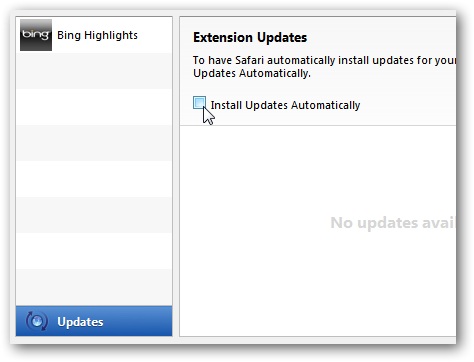 Oddly, Safari will not automatically download and install updates for extensions by default. However, you can activate automatic update if you’d like. 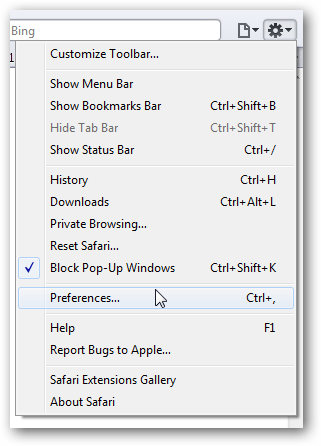 Open the Preferences window and select Extensions as above. This time, select the Updates link in the bottom of the extension list. Check the Install Updates Automatically box, and you’re all set. 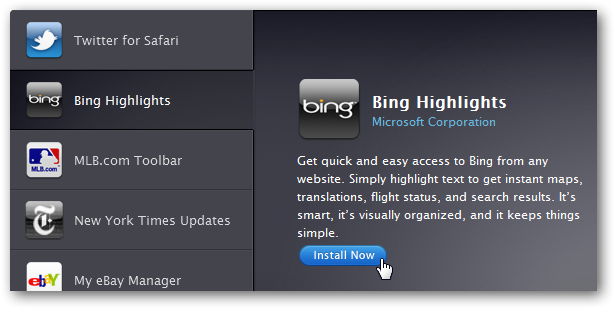 You can still install extensions for Safari from other websites as before, but it’ll take 3 or more clicks to install. When you find an extension you’d like to install, perhaps from a site like the Safari Extensions blog listed below, click the link to download the extension and then select Open at the prompt. Safari will double check that you wish to install this extension. If you’re sure you trust the extension, click Install to add it to Safari. Now it will work just like all other extensions, and you can remove it just like you would any other extension. Although the Safari Extension Gallery is brand new, it already contains many nice extensions that rival extensions in the Google Chrome browser. We’ve already tweaked Safari on our computers with nice new features and tools. If you’re not sure if the Extensions make it worth your while to try out Safari, check out the link to the Extension Gallery below to look around before you try it. 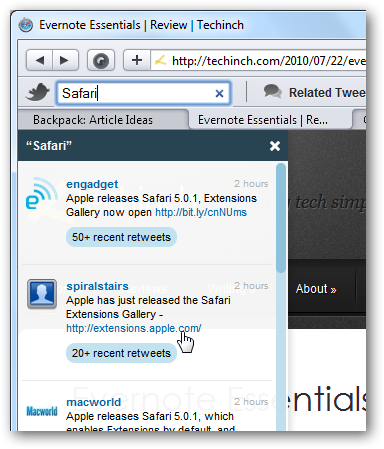 Safari 5 is free for Macs and PCs, so feel free to try it out and let us know what extensions you like the most.